One hundred and ninety-five Earth pounds for the finest graphics chip AMD currently produces? A GPU with no less than 1,600 stream shaders, support for DirectX 11, a triangle-mashing hardware tessellator and much, much more? That's got to be some deal, right? Yes and no. The Radeon HD 5830 chipset is indeed based on AMD's mighty Cypress chip. But in this guise it's been given a thorough pruning. First for the chop is that forest of 1,600 stream shaders, trimmed back to 1,120. The texture unit count also tumbles from 80 for the full-on 5870 chipset to just 56, while 16 of Cypress's 32 render outputs have also been hacked off. It's not all bad news, however. While the Asus EAH5830 DirectCU sticks with the reference AMD clocks, that still means a healthy 800MHz core frequency and 1GB of GDDR5 memory humming a 4GHz tune and pumping through a pukka 256-bit bus. The latter gives the 5830 an obvious advantage over the Radeon HD 5770 and its scrawny 128-bit bus. Where Asus has departed from the 5830 norm is the custom heat sink and support for serious voltage tweaking courtesy of an eight-pin power rail. Put the two together with the auto overclocking feature in Asus's bundled SmartDoctor and you ought to have a recipe for quick, easy and effective overclocking. Unfortunately, SmartDoctor utility failed to work as advertised in auto mode. Switching to manual, we hit 975MHz for the core clock. That's a healthy boost and likely more than you'll manage with a standard 5830. But it's not enough to remotely frighten a cooking Radeon HD 5850 board, something that's available for just £30 more. A cheap version of a top chip is usually a recipe for great performance at a much more palatable price. Add support for over volting into the mix and you have a nice little package for performance enthusiasts hunting for a bargain. Granted, hitting this price point has meant disabling a fair chunk of shaders, texture units and ROPs. But it's still quicker than a full-on midrange board such as MSI's 5770 Hawk, if only just. You also get a full DX11 feature set including as much tessellation performance as any Radeon HD 5800 board. That's just as well given that we have doubts about the tessellation throughput of even the top Radeon HD 5870 single-GPU chipset. Then there's the promise of some GPGPU goodness courtesy of Compute Shader support. You never know, the hype surrounding general purpose processing on a GPU might just turn out to be true. If it does, the 5830's 1,120 shaders should tear through highly parallelised tasks like video encoding. What makes sense in isolation sometimes doesn't always add up under the pressure of competition. With that in mind, the Asus EAH5830 DirectCU struggles when lined up against slightly more expensive cards based on AMD's Radeon HD 5850 series chipset. In fact, Asus's own EAH5850 Voltage Tweak, based on the Radeon HD 5850, is yours for an extra £30. It's not a lot extra to pay for a card that comes awfully close to the big boys in the £300+ segment. Making matters worse, it doesn't put enough space between itself and much cheaper midrangers. There's no getting round it. At £195, the EAH5830 just doesn't make sense. Whether you're talking CPUs or GPUs, a cut-price version of a high-end chip usually nails the price-performance sweet spot. Sometimes, however, too much is lost in translation from uber-GPU to affordable pixel pumper. Unfortunately, that's the case here. 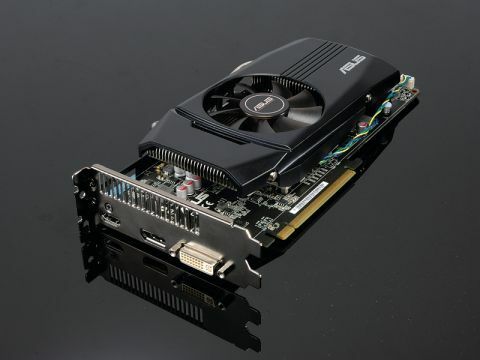 Ultimately, the EAH5830's problem is that the price gap between it and your average Radeon HD 5850 board is much smaller than the gulf in performance. At the same time, it's massively more expensive than a Radeon HD 5770 card but only marginally faster. And that despite the factory overclocked frequencies. Our advice is either to step up to a 5850 or save yourself a wad and and go with a 5770.